Designed to withstand the rugged demands of the loadings of blocks and winches, Vectran® is a Thermotropic Liquid Chrystal fiber with the finest technical characteristics to incorporate into any high performance braid. Vectran combines all the benefits of Spectra® with the advantage of Kevlar® to produce a rope that will not stretch or creep under the extremes of continuous long term loads. Vectran® can be used in core, jacket or be blended with other fibres to enhance heat dissipation. Challenge Braid was developed on America ’s Cup and Whitbread yachts before being released into the general leisure marine market. 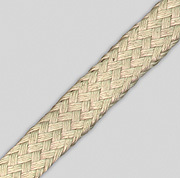 Consisting of a 100% Vectran® 12 strand core (8mm+) with distinctive polyester jackets, Challenge Braid is ideal for applications such as Genoa Halyards. Features/ Benefits: Vectran® replacement for standard polyester jacket in high temperature / high abrasion applications, can be urethane coated.